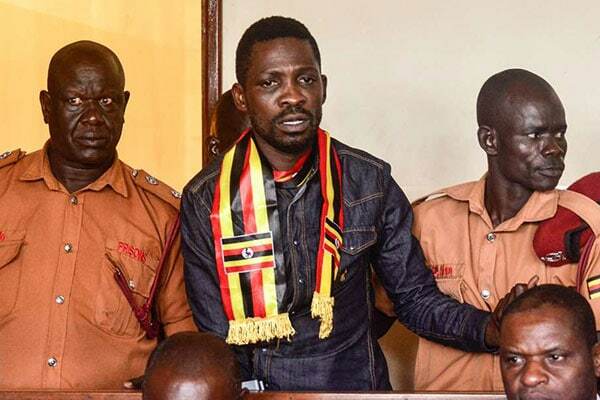 Uganda’s music sensation and current Kyadondo East MP Robert Kyagulanyi aka Bobi Wine was arrested at Entebbe International Airport last night as he sought to travel to the US for further treatment. According to his wife, Barbie Kyagulanyi, Bobi Wine was blocked from travelling to the Washington USA despite having doctors letter indicating that he needed special medical attention. Bobi Wine’s wife also indicated that Robert Kyagulanyi was beaten inside the ambulance before being dumped at Kirudu Hospital. “He told me that as soon as they closed the ambulance doors, he was again brutally beaten in front of a government doctor. They switched off the lights in the ambulance and started battering him! Bobi is now back in pain and he is dumped at Kiruddu hospital. He has missed his flight and time is running out,” she said. Bobi Wine’s lawyer Robert Amsterdam has condemned the move saying the MP committed no crime and didn’t deserve such treatment as he had valid reasons to travel through the airport. Another MP, Zaake Francis was also blocked at the same airport from travelling to India for further treatment. Police sources have indicated that the MPs were blocked from travelling abroad as they might return to the country with reports showing injuries which are not real. Do you have a story you want told? Do you know of a sensitive story you would like us to get our hands on? Email your news TIPS to news@kahawatungu.com. Also WhatsApp 0708677607 with your news tips.